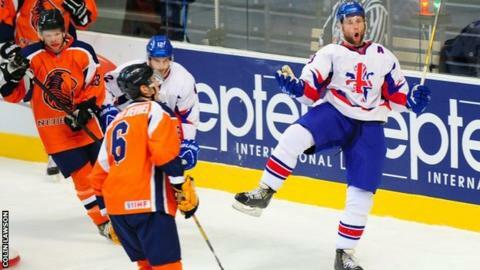 Great Britain beat the Netherlands 4-3 in their latest World Championship Division 1 Group B outing in Vilnius. Britain cannot be promoted to Division 1A, but the win means they could still secure the group bronze medal. Colin Shields and David Clarke put Britain into a 2-0 lead after only 51 seconds, but the Dutch stayed in touch. Danny Meyers and Matthew Myers also scored for Britain, who must beat Poland in regulation time and hope Lithuania beat Croatia to stay third. A Britain victory on Saturday over the Poles, who have won the group with four wins out of four, and a win for Lithuania would see Doug Christiansen's side move past Croatia into the bronze medal position. "We have played better in this tournament and lost, so we will take a win any way it will come," said head coach Christiansen. "A bronze medal is still a possibility and the boys have set their sights on."